Three EU regulations establishing the Horizon 2020 Framework Programme for Research and Innovation, the Erasmus+ Programme in the field of education, training, youth and sport, and the new “Creative Europe” Programme, were among the 78 legal acts incorporated into the EEA Agreement by the EEA Joint Committee at its meeting on 16 May 2014. Other acts incorporated at the meeting included the so-called road package from 2009 and a directive from 2010 on on the investigation and prevention of accidents and incidents in civil aviation. The road package establishes rules concerning the occupation of road transport operators, access to the international road haulage market and access to the international market for coach and bus services. The main objectives of the acts are to eliminate legal uncertainty for hauliers and adapt the legislation to the market needs. The new Erasmus+ Programme will fund grants for students, teachers, trainers and apprentices to study abroad in the EEA and partner countries. Youth leaders, volunteers and young sportsmen and women will also be eligible. In addition, a new guarantee mechanism will enable master’s degree students to obtain cheaper loans to study abroad. Erasmus+ will bring several long-standing education, training and youth programmes such as Erasmus Mundus and Leonardo da Vinci, as well as other means of cooperation with industrialised countries in the field of higher education, under one single umbrella, and will include sport for the first time. These sub-programmes will keep their labels, which are well known to the public. Over the next seven years, the new Creative Europe Programme will promote the mobility of European artists and works, and help audiovisual professionals to adapt to the digital age. The new guarantee mechanism should leverage funding for microenterprises in the cultural and creative sectors. All potential players in cultural and creative projects such as video game designers and theatre or street artists will get easier access to funding by obtaining European bank loans partially guaranteed by the new mechanism. Today’s incorporation of these regulations ensures the participation of the Iceland and Norway in all three programmes, along with all 28 EU Member States. Liechtenstein has decided to only participate in the Erasmus+ programme. The EEA EFTA States will now be eligible to take part in the first round of applications. Other EU programmes are under consideration for incorporation into the EEA Agreement in the coming months. 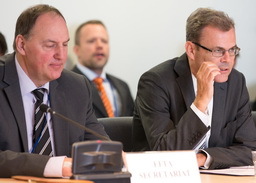 The EEA Joint Committee, chaired this semester by the European External Action Service, is responsible for the day-to-day management of the EEA Agreement. It provides a forum for the EEA EFTA States and the European Union to exchange views and take decisions by consensus to incorporate EU legislation into the EEA Agreement. The meeting schedule for the EEA Joint Committee for second half of 2014 was approved. High resolution photos from the meeting.